The following details were received from Peter Hales. We are very grateful for support like this which helps us to maintain and enhance the details on the site. If you have any similar pictures or information then we would love to hear from you. Please contact us by email or phone here. I attach a couple of JPEG files scanned from original postcards of Rainham, provided by my Godfather, Geoff Gilbert. 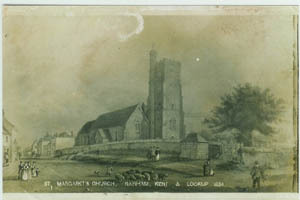 The first is a picture of the upper end of Ivy Street and is taken from a postcard dated 1913, which ties up with the 1912 date on the front of the card, and shows the shop owned by W. E. Jones, who was Geoff’s grandfather on his mothers side of the family. The shop was divided into two, with an Off Licence to the right and a Grocery to the left. 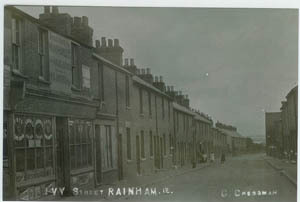 Geoff was born upstairs in this house in the room behind the Colman’s Starch advert, although not until the mid 1920’s. His mother lived for many years in No1 Ivy Street, and I can remember visiting her in the house as a small child in the mid 1950’s. Geoff now lives in Abingdon, Oxfordshire. And me? – well I was born in my grandmother’s (May Boakes) council house at 19 Holding Street in 1951. We lived for many years at 79 Station Road on the corner of Webster Road, and I attended both Soloman Road infants School and (the then new) Wakeley Road Junior, before passing the 11+ and going on to Gillingham Grammar, by which time we had moved to 25 Thames Avenue. We moved away from Rainham in 1964.